For people of a certain age, it’s impossible to think back on our childhoods without conjuring images drawn by Dr. Seuss (Theodor Seuss Geisel, to his friends and family). Even looking through his books today, their style seems fresh and their stories an eye-opening guide to the world of life’s adult complexities. I still have to watch How the Grinch Stole Christmas several times each holiday season just to sob every time. Putting the man behind Green Eggs and Ham into the larger context of his life and times is bound to seem like an awkward fit. Our childhood icons seem to resist being fixed in the real world. But his kids’ books were only part of his career. For starters, Dr. Seuss wrote some of the military’s WWII instructional shorts in a series called “Private Snafu,” working with such cartoon notables as Friz Freling, Bob Clampett and Chuck Jones (with whom he’d later create that TV version of The Grinch). Seuss was also a political cartoonist for several years before and during the war. And to see his familiar style put to such specific political messages feels … well, kinda weird. But now that U.C., San Diego’s Mandeville Special Collections Library has put a number of these images on their Web site, you can experience that discomfort for yourself and come to your own conclusions. Two hundred of these cartoons are also collected in the volume Dr. Seuss Goes to War: The World War II Editorial Cartoons of Theodor Seuss Geisel by Richard H. Minear. Seuss’s attitude about the war in Europe is pretty clear in the cartoons. American feelings about our involvement in a war across the ocean — particularly with the first World War being only a short while behind us — were mixed. Moreover, anti-semitism and anti-communist sentiments led a great many Americans to approve quietly of Nazi genocide and empire-building, however little they expressed their feelings out loud. 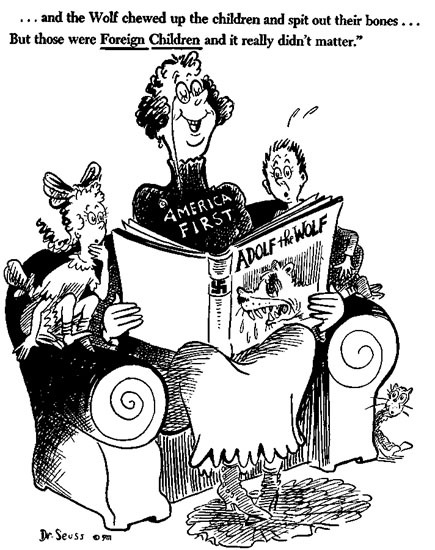 Seuss appears to have had little patience for isolationists and Fascist sympathizers, particularly for Charles Lindbergh and his America First movement (yes, that Charles Lindbergh, the trans-Atlantic pilot). 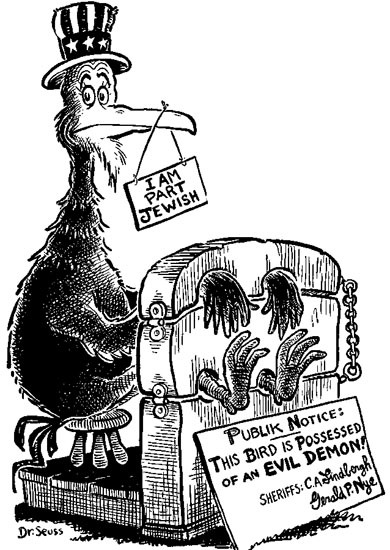 Seuss’s attitudes about racism and anti-semitism were pretty clear, too; at least at home. When it comes to his portrayal of Japanese figures across the Pacific, he falls back on the same dehumanizing caricatures that appeared in every war poster to feature images of the enemy. Germans and Italians usually came out looking just oafish; but the Japanese appeared inhuman. 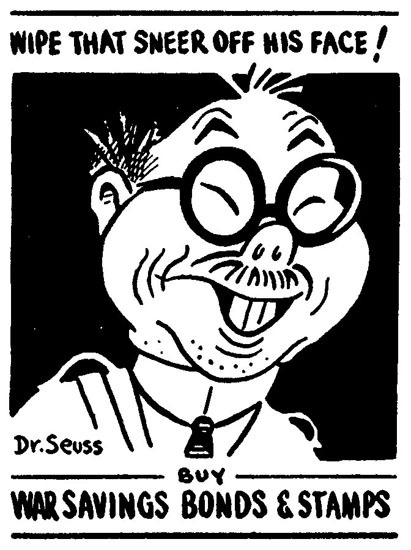 The UCSD collection can’t be the last word on Seuss’s political cartoons, but still there’s a conspicuous absence of anything addressing the matter of the internment of Japanese-Americans, even while Seuss demonstrates in a number of his cartoons that he’s brave enough to hammer on the War Department for discriminating against African-Americans. It’s hard to see our childhood heroes tethered to the real world in which they lived. But it’s also interesting to get some perspective on the pieces of their lives beyond the edges of the stuff we remember them for best. Thanks to the folks at Shakesville for bringing this to everyone’s attention.